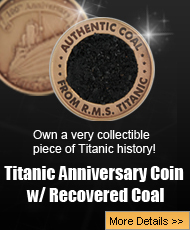 What happened to the Titanic in 1912 is something that has never been forgotten even in the 102 years since the disaster. The biggest lessons in the world of history are tragedies because they can teach people important lessons in a way that nothing else can. 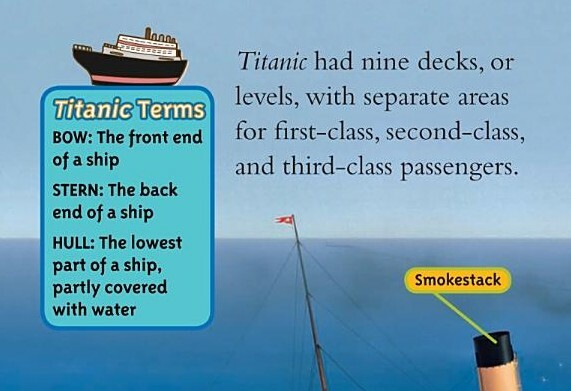 However, the exact details all about the Titanic may be a little too complicated for kids to understand, but to make it easier to comprehend, there is a book written by National Geographic called National Geographic Readers: Titanic. When people hear the name RMS Titanic, what are the first things that come to mind? People usually think of things like the fact that it was one of three sisters that were supposed to be the biggest ships in the world, but also offered its passengers the most luxurious of accommodations whether they were in First Class, Second Class, or Third Class. Another point about the Titanic that people may think of is all the publicity that the ship had a lot of stories written about it, including in a magazine called Shipbuilder, that talked all about the amazing safety features that the ship had. With things like the watertight doors that could be closed with the flick of a switch, the Titanic was called practically unsinkable, and everyone in the world knew it thanks to the publicity. However, children under a certain age are not going to understand things like watertight doors, or the fact that the RMS Titanic was an unsinkable ship. The National Geographic Readers: Titanic book takes on the difficult task of explaining things about the Titanic in very simple language that makes it understandable for kids no matter how old they are. The National Geographic Readers: Titanic book contains pictures of the legendary RMS Titanic, there are some pictures in it that are actually from the ship itself. Before the Titanic set sail, some pictures were taken of certain parts of it like the bridge, the café, and the wireless room. However, the rest of the images in the book should be familiar with anyone that studies the RMS Titanic because they are actually paintings that were created by a very famous Titanic artist named Ken Marschall. 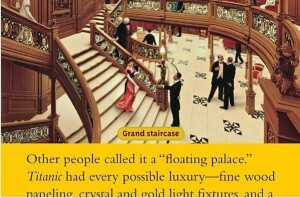 The great Titanic Ken Marschall has been painting the most amazing artwork involving the Titanic since he was a kid. Every single Titanic book that has ever been published usually has at least one of Marschall’s paintings in it whether it is the front cover, the back cover, or an image somewhere in the book itself. No one has ever been able to create the most realistic images of the ill-fated ship like Marschall, and owning at least one print of one of Marschall’s infamous paintings is a goal of every Titanic enthusiast. The best of Ken Marschall’s Titanic paintings are featured in the National Geographic Readers: Titanic book, and the paintings that are in the book depict the inside of the ship itself, and also the most famous paintings of all, the ones about the sinking of the magnificent ship. Death is never an easy subject to talk about for adults let alone for little kids who are in grade school. While the subject of the Titanic might be brought up, the idea of talking about the deaths of over 1500 people is not something that children might fully understand because they are young and their experiences with death may be limited. 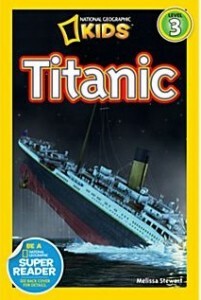 The National Geographic Readers: Titanic book does not really focus on the death itself, but talks about the Titanic’s many features and its sinking, but does not really focus on the fact that so many people died. When children get older, they really will get to read more about the Titanic, and that is when they will get the full scope of the disaster. 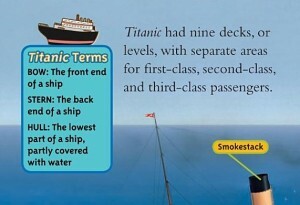 The National Geographic Readers: Titanic is all about the RMS Titanic, its features, and its infamous maiden voyage, but the way that the disaster is handled makes it simple enough for kids to understand, but not too detailed that it will upset them. 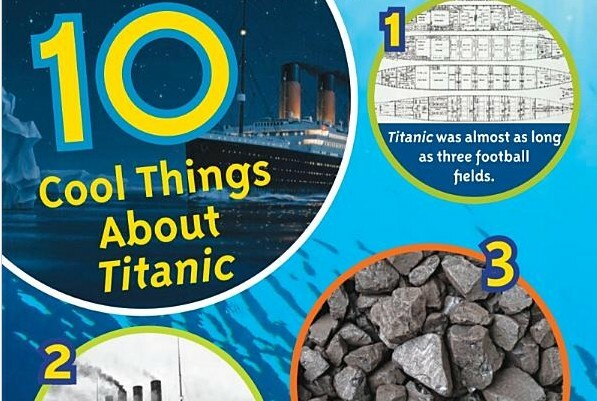 Children have to learn about death as they grow up, and a simplified version of the Titanic disaster will help them understand that bad things do happen, and to learn the lesson that the disaster itself taught the whole world.